Weekends Count Magazine - Education & Family Travel: The Sea Lions and Otters of Pacific Point Preserve at Sea World San Antonio! The Sea Lions and Otters of Pacific Point Preserve at Sea World San Antonio! When you visit San Antonio, be sure to check out Pacific Point Preserve at Sea World! Our little one got a quick lesson from one of the animal trainers! We also fed the sea lions at Pacific Point Preserve! The sea lions leaped out of the water to catch the food! The sea otters were also a hit with our daughter! 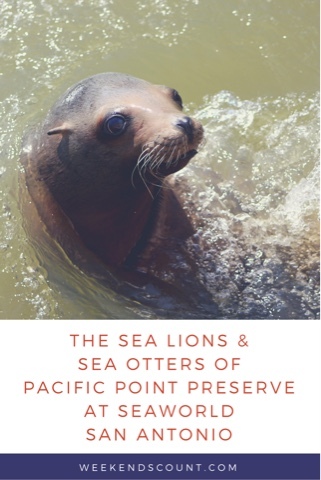 While you're at Pacific Point Preserve, you can also view Sea Lion High at Sea Lion Stadium next door! After visiting the theme park, you can review the Sea World's Info Books about Sea Lions and Sea Otters to reinforce your child's learning. Don't miss Pacific Point Preserve on your visit to Sea World San Antonio!